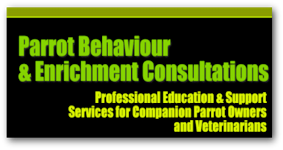 Pets Behaving Badly offers solutions to owners of pets with behavioural problems. Training methods are reward based and gentle, using positive reinforcement. Barbara is busy working on more resources for parrot enthusiasts. 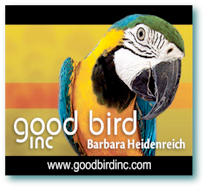 Join the Good Bird Inc mailing list and be the first to know when she has something new to help you with your parrot behavior challenges and training goals. Susan is a psychology professor at Utah State University. 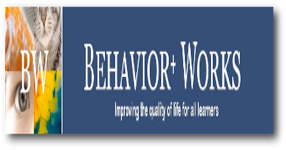 Over the last decade, she has helped pioneer efforts to apply to animals the scientifically sound teaching technology and ethical standard of Applied Behavior Analysis that is so effective with human learners. As care givers we expect our parrots to instantly act and behave, why? 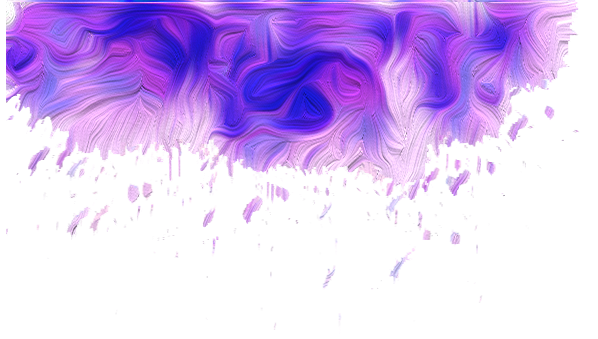 What makes us think it is already imprinted in them how they should behave? It isn't the case with wild parrots. Wild parrots learn everything from the adults from what to eat, when to eat, how to behave, yet we expect all of this to be instant. The same rule applies to our captive parrots and majority of them will learn unwanted behaviours from us. It’s easy to do and easy for us to label any unwanted behaviour and accepting it as being part of the bird. Instead, we should be taking a close look at that behaviour and trying to figure out why it’s happening, so it can be fixed. There are a number of behaviour websites available with a lot of information and videos to give you a great start in understanding your bird and curbing their behaviour. Some are listed below.